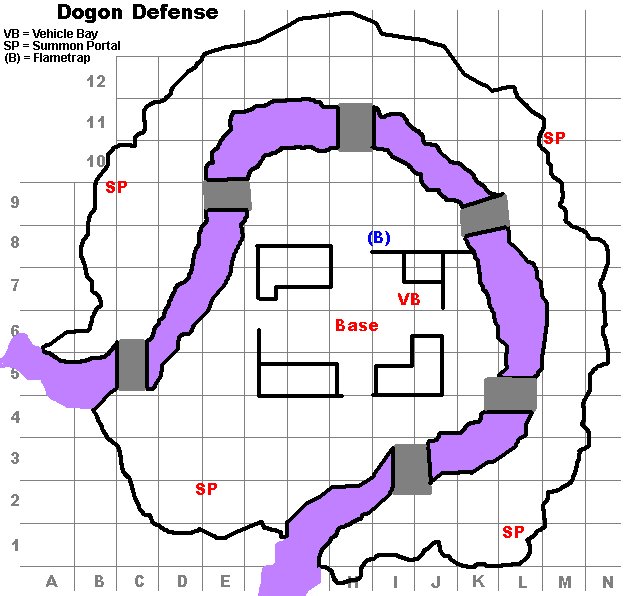 This is not a real trap map, see text. a) You never ever leave the base. Because of that the map above does not show all traps, only one I accidentally triggered. I assume that every entrance has a similar trap. b) The waves are only roughly predictable. c) There is only a rudimentary strategy involved, compared to Last Stand. It is more or less a comparison between your gear and the monsters. d) The mission is not time-based. At the end of each wave the enemy gets his turn and only then, at the end of the enemies’ turn, the cut-scene triggers, starting the next wave with your first turn in it. This way you don’t get two turns in a row (that would too good to be true…). Your mission goal is to survive. And not only you must survive but also the base camp (Dogon Warehouse). It has about 43k hp and can take some hits. It heals between turns a bit. 1. Never get stunned. Better sacrifice an attack, group your mercenaries together and spam an awakening scroll (which takes effect in a 7×7-grid with you in the center, by the way) than killing some monsters and then stand there completely stunned. 2. Take out the cannon mobs first if you have a choice. Then the blue ones with their nasty “blazing earth” simile with which they hit all types of mercenaries. 3. Try to lay traps if there is a break. Personally I see no great use for a catapult here. That may be different for non-cannon mains, though. I don’t wanna be rude or something similar, but this is the second video i see about dogon defense and to be honest, this is not the best. You survived because of your gears, you can take heavy hits while still standing and you made it only because of this. * first rule of this mission is to not hit mobs that are caught by traps, you made this several times, instead of attacking free mobs. this comment is not about to criticize your mission but to point out the direction where need to be focused. Yeah, I have a lot to learn about this mission. I just started to do it. When I have more routine I will post another video. UPDATE 2012-07-30: I replaced the video with a better one. I tried it once and I can say what will happen: You fail. The monsters will overwhelm you at the base and kill it quite fast. May be when we get to level 160 we are able to do that.